Do you know how well your website is performing organically in Google searches? Do you have any idea as to what factors can help you rank more highly with search engines, and whether your site is truly optimised to be visible to Google, without using paid advertising? JFM Sales and Marketing specialises in tailored SEO Strategies for SMEs. Currently we are offering a full site audit for £300, which will look at both technical and content aspects of your site. 'Content is King'and therefore it is essential to understand how content quality and volume may be affecting your search engine performance. The regular price for this audit is £600 so we have created this special offer of £300 for Woking Chamber members. As a bonus you'll also receive a list of content topics (for use in articles and blogs) that are receiving the highest online search volumes in your particular field! Contact us now on info@jfmsalesandmarketing.co.uk for more details. Stressed, overwhelmed, time poor and needing a holiday? If so, let me help. Summer holidays are fast approaching so I'm here to help if you don't have your holiday planned and are fed up of looking on the internet, don't have the time or find the whole thing stressful. This is a free service that gives you great value holidays all round the world. 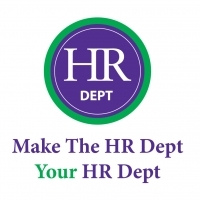 Do you want to decrease absenteeism, presenteeism and staff turnover, and build resilience to workplace stress? 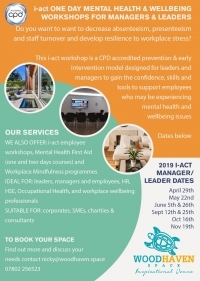 This practical i-act workshop is CPD accredited and is both a prevention and early intervention model, designed for leaders, managers, Health and Safety and HR professionals, and anyone looking to build a sustainable future for their business. Gain the confidence, skills and tools to support employees who may be experiencing mental health and wellbeing issues. 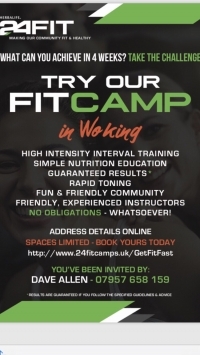 I’ve teamed up with Chamber member Nicky to run this accredited i-act training at her stunning state of the art eco-smart venue Woodhaven in Horsell Woking. How do I know whether or not my business is solvent? There are two tests of insolvency - the cash flow test and the balance sheet test. If your business or company fails EITHER test you are deemed insolvent. The cash flow test - Can the business pay all its debts as they fall due? If a business cannot pay all of its debts in accordance with the creditors terms and conditions the business is insolvent. Pilates has something to offer to people of all ages, levels of ability and fitness. Core strength is vital to health and wellbeing. Like to feel strong and good? Join of our small friendly mixed classes. Beginners welcome. 1-2-1, or to improve your technique or tailor made to your needs. Are you about to take on your first employee? Or perhaps your business is growing? Does employing people, or the thought of employing people, keep you awake at night? We understand how confusing and challenging employing people can be, so let us help you by providing the right solution for your business. Woking Chamber's free Member-to-member offers service allows you to publicise an offer at any time to other Chamber members at no cost to you. Just log-in to the members area and add and edit your offers.